Love is a beautiful thing- it feels like the oldest page in the book when it comes to writing, but there is nothing better to me than a character motivated to take on massive challenges for love. Unfortunately, I think there is a huge disconnect between what kind of love a character has that motivates them. There is the common thinking where there is an intimate love, something between lovers- this can range from the tried and true story of “Protagonist gets lover taken away from him, man goes on warpath to get em back” (see: every action film from 1980-present) to more abstract intimacy, such as a longing to hold on to a previously long lost love (I immediately think of the novel Solaris by Stanisław Lem where the protagonist is objectively more in love with the concept of what life he could have with someone he lost than the actual person). The kind of love that I particularly am drawn to is portrayed in a way that doesn’t seem to come to mind as often- the soulful love, the yearning to protect not only people, but things, places, and concepts. Family, friends, the integrity of a game (I am an absolute sucker for sports movies where teams rally together for the love of a game) all have lasting power with stories that stick out with emotion, no matter how borrowed the beats of the story are. No character has the chords of love pulled, plucked, and torn quite like the title character, Lelouch Lamperouge. The fires of rebellion are sparked when he swears to make responsible parties pay for what he did to his mother and little sister, Nunnally. With his mother dead and his sister blind and in a wheelchair, Lelouch lays it on thick with the burning hatred that is only rivaled by the love he has for his little sister. While we would later find out (much too late for the people whining about the fact she always has her eyes closed “BLIND PEOPLE AREN’T LIKE THAT” you’ll find on a number of episode comments on FunimationNow) that Nunnally’s blindness was about as real as Ron Burgundy’s was, the moments between the two of them really tug on the heartstrings. The development of Lelouch’s character is incredible- he finds out that one of the people he swears he will change the world for ends up being in on the event that paralyzed his sister in the first place, shattering him. Rather than fall all the way down the hole, he doubles down on his convictions and lets his desire for a better world for his sister carry him through a whole half of the series. There is so much to be said for someone who loses their way being motivated by their love for someone to rally back and fight for those they still have. What seems like empty words usually heard in action series like “I swear I’ll do it, no matter what” are used to the full extent of his actions. Lelouch does some tons of messed up things (see: basically everyone else to follow) to make an example out of how corrupt monarchies (or in the case of what he charades as-a dictator) as can be- sacrificing himself as the final exclamation point at the end of the the entire message. What really hits it home, is that it was all for his sister. The world was such an unbearable place for innocent people to live, and Lelouch knew that overthrowing one corrupt seat wouldn’t be enough, and took it on himself to become the epitome of what corruption looks like. With even his sister hating him over it, he continued on driven by love. 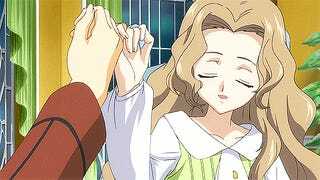 Thanks to the McGuffin of all McGuffins, Nunnally is able to find out everything her brother did for her as he is dying, and the emotion in the scene gets me every time. It is so fantastical of a scenario to happen, but this is that kind of love I was talking about earlier. He damns himself for all of history for a better future for his sister. Now this falls more towards the traditional definition of love in fiction, but with a brutal twist. My favorite character in Code Geass bar none is Shirley Fenette. Hush on your gross waifu talk, let me explain. She’s a non-combatant and yet she gets quite a bit of screen-time in the series. She’s pitched as the “unrequited love” character for a good chunk of the first half, but then things start taking a dark turn fast for this Student Council member. Lelouch, in all of his blaze of war, carries out as the champion of the Japanese, Zero. Business is booming for Zero and company as they win multiple guerrilla conflicts after one another. Of the casualties of their war, however, Shirley’s father is one of these lost. Lelouch finds out in a grim fashion that Zero and his forces were responsible for taking away Shirley’s beloved father firsthand by her grieving. As if losing her father wasn’t enough, Shirley finds out that Zero was actually Lelouch, the young man she has eyes for, and almost guns him down over it. Lelouch wipes her memories and has her live an ignorant life without knowing what he did. Then, remarkably, she gets tangled up with Lelouch again despite not remembering what happened, only to have her memories restored...again. So the poor gal falls for this guy twice, learns he killed her father twice, and has to deal with the conflict of her emotions twice. Consider for a moment where the sanity of a character would be at this point- no doubt she wasn’t particularly right in the head after knowing such things happened to her, were scrubbed over, and still were happening around her without any remembrance. 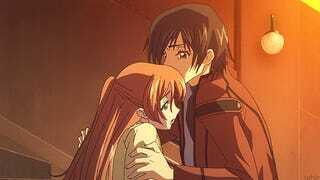 Shirley still decides to keep supporting Lelouch with a heavy heart, leading her to her own demise. I’m talking like, chasing down the guy who she thought would do her man in at the station and plan on taking care of the issue kind of support. I honestly think the last scene with her in was what won me over for Johnny Yong Bosch as one of my favorite voice actors, as this scene trumps not only any other part in the series, but it is on my shortlist for parts that wreck me the worst. ...then, like every other relationship in this show, Lelouch comes along to ruin everything. In a situation too unfortunate for me to link (or even mention in detail), Euphemia....says something not in her right mind...and creates a bigger rift between the Britannia forces and the Japanese resistance. This was caused by an accident at Lelouch’s hand (because of course it was), which, let’s throw it in there for the score count, was best friends with Suzaku and the half brother of Euphemia. Needless to say, Euphemia gets fatally wounded and Suzaku has to watch her die. Let me repeat: Suzaku had to watch the woman he was in love with die. Now, that isn’t uncommon for the series, but it was the earliest domino to fall like that. I absolutely understand that resentment he carries for the rest of the series after discovering it was Zero (and later on, Lelouch) that made his love be in that state of mind. What adds layers to the story is that Euphemia had progressive views on foreign affairs, and Suzaku ends up embodying her beliefs. These beliefs, surprisingly, are the exact same as the ones that Lelouch wanted for his sister, just from a much more pacifist line of achievement. All in all, this series has a perfect length as is- it isn’t too short or too long over the course of four cours, and it makes the characters incredibly endearing. One of the best aspects of these characters being developed hands down is their motivation driven by love. Love is the greatest motivator in life, and it is great to see it represented on its wide scale in an anime. I wanted to go into this sisterly bond, but I think keeping it to three was enough. This picture should speak a thousand words. What are some of your favorite signs of love in anime? Random bits of trivia I found while researching for this article: Shirley is listed as 5'9" and Euphemia is listed at 5'8" while Suzaku is listed at 5'9" and Lelouch is 5'10". This is remarkable because most of the examples I found/remembered watching the series had the guys looking so much taller than these two, even if they are next to their height. I don’t know what’s in the water over there, but wow.